For stunning, full-length movie star eyelashes, try MarveLash. It's an eyelash enhancement serum that stimulates the healthy growth of your eyelashes. After only a couple of weeks of use, MarveLash will give you those longer, thicker lashes you've been dreaming of. Drugstore volumizing mascaras flake, leaving behind a chunky, unhealthy residue on your lashes. A more beautiful, natural look can be yours with MarveLash. MarveLash's powerful formula was designed to rejuvenate, revitalize, and grow your eyelashes. With a blend of humectants (substances which help to retain water) and vital nutrients that work jointly to stimulate your hair follicles and promote eyelash growth, MarveLash is safe, non-irritating, and truly beneficial for your eyelashes. For best results, apply MarveLash serum nightly just before going to sleep. Thoroughly cleanse the area around your eyes to remove any makeup, then apply MarveLash to your upper and lower lashes in the same way as you would apply mascara. MarveLash can also be used to stimulate eyebrow growth. You will begin to see results within a few days, with full results in 3-4 weeks. This exceptional crystalline powder is used to protect your eyelashes and stimulate additional growth. Allantoin is safe and has been utilized in many skin care products for decades. Panthenol locks in moisture within the follicle shaft to give you thicker, darker, longer-looking lashes. Biotin-deficiency can cause eyelash and eyebrow loss. MarveLash is fortified with biotin and other B vitamins to protect against eyelash loss. Glycerin is a natural humectant known for promoting hair growth. Not only does it hydrate your lashes, glycerin also repairs and stimulates the growth of each and every lash. 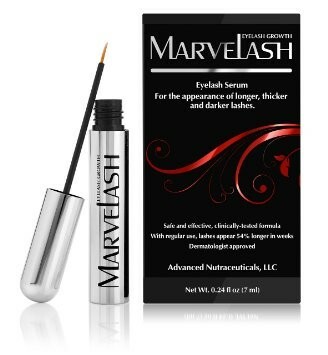 MarveLash is a clinically tested eyelash enhancement serum that is safe and easy-to-use. With MarveLash, you no longer need to purchase countless mascaras or go through the inconvenience of applying false eyelashes. MarveLash is infused with a blend of proteins, provitamins, and herbal extracts, which deliver moisture and nutrients straight to your lash follicles to stimulate healthy, natural lash growth. It can improve the length and density of your natural lashes by as much as 82%. In scientific studies, MarveLash has been proven to drastically enhance your natural lashes without causing any skin discoloration or irritation. MarveLash's natural formula is gentle enough to use on the delicate skin around the eyes. Plus, it's packaged in a mascara-style tube so it can be applied like regular mascara.